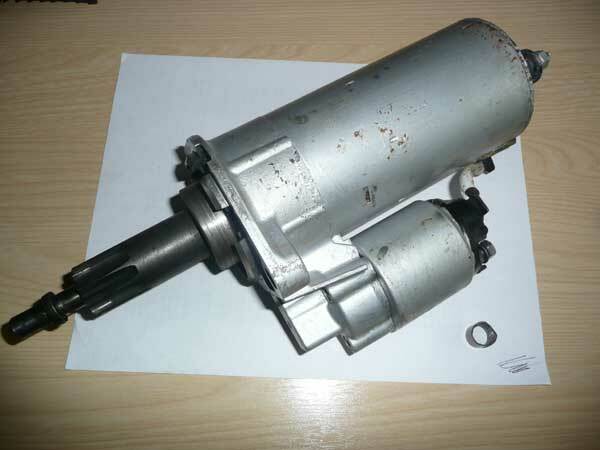 It turns out that the windings of the starter motor were parting company with the armature. 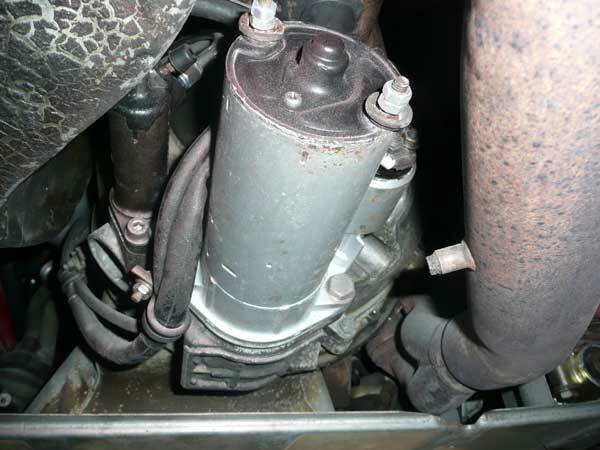 When the motor became hot, the connections became worse still, leading to a lack of starter motor action. 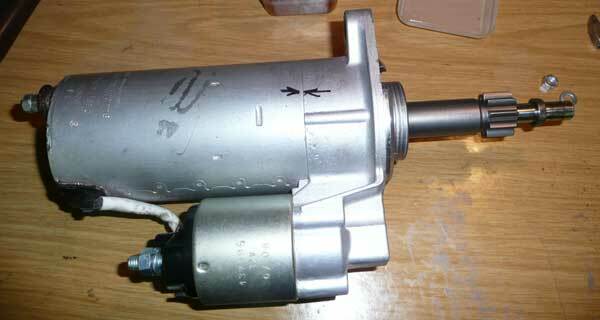 The problem with our starter motors keep cropping up once in a while and mine has been causing that embarrasing problem for a year or 2 now. 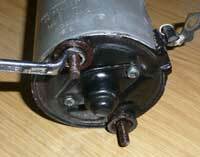 I have taken the starter motor off previously and given it a good clean, regrease and repaint. It did seem to be OK for a while but it now gives me a problem whenever I try to start the engine when it is already warm. It's difficult to describe the noise but I'll have a go, it's a click, a whine and a very loud metalic sounding clunk or bang. 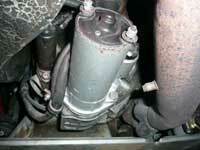 Anyway something needed doing, so off with the starter motor again and have a proper look. 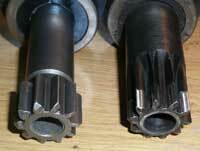 3. the pinion shaft bush. 1. I had already previously(a couple of years ago) taken the motor apart and given it a good clean while also checking the brushes and the internal bushes. 2. 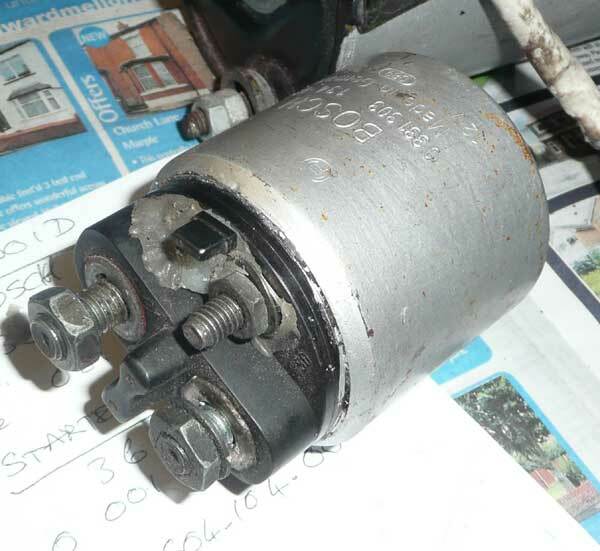 With regard to the solenoid I came to the logical conclusion that if I need to replace it or am getting a new motor I might as well pull the other one to bits just to have a look inside and see what the problem might be. 3. 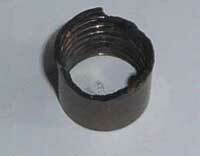 Considering the pinion shaft bush is now 16 years old it would be a good idea to replace it anyway. and also removed the bush. To remove the bush I removed the plate from the back of the housing(8mm spanner), wound an M12 second taper tap into the bush from the starter motor side and then lightly tapped on the end of the tap which was now protruding from the back of the bush. If you don't have an M12 tap handy you can use a socket or strong wooden dowel from the back and tap that to knock out the bush. I measured the bush at 11.7mm i.d. which didn't seem too bad and certainly not bad enough to have caused such a problem(the internal marks are from the M12 tap). Going back to the solenoid, some of the information I found suggested that the contacts in the solenoid can become burnt and blackened. 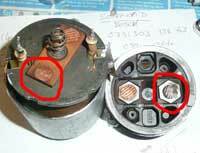 Which will cause a resistance to the current and can cause some problems. The contacts do look 'well used' particularly on one side. I needed to order at least a new solenoid so got onto an autoelectrician mate and took it for him to have a look at, he confirmed that the bush didn't look too bad and that the bad ones are normally worn into an oval and sometimes into the aluminium housing, he also said that he had seen solenoid contacts looking a lot worse. 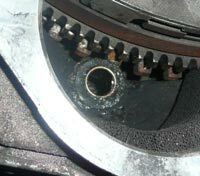 He did say that it might be a good idea to replace the pinion. 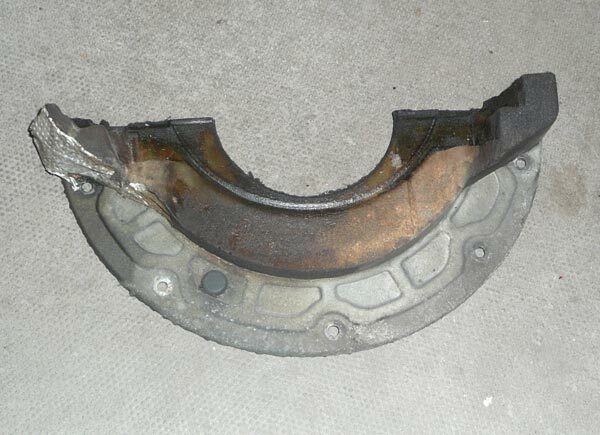 So I've now ordered a new pinion, solenoid and bush. I'll update the report when I have a result. After assembling the starter motor and solenoid I took the assembly to my mate at VES(Vehicle Electrical Services) in Stockport and he confirmed it all looked good. Spent this afternoon installing the new bush, putting the motor and the flywheel shield back on the car. Here are some pictures of the parts and how I did the job. 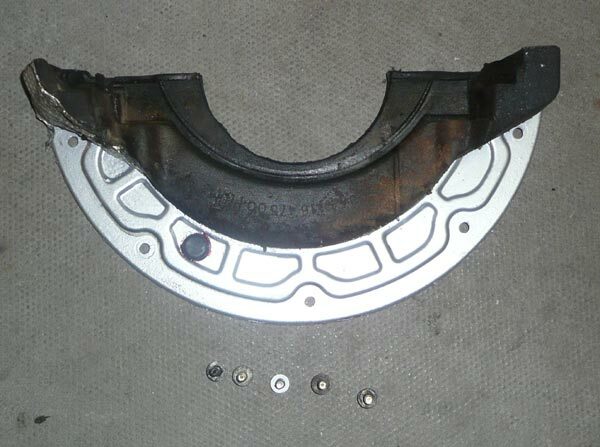 These are pictures of the flywheel cover plate, be careful when removing it as it has a foam 'seal' bonded to it which can tear. Same cover plate just cleaned up a bit, don't know what the rubber grommet is for but I took it out and refitted it with some rubber grease to prolong it's life although it doesn't come into contact with anything and the position that it is in it is shielded behind the sump. This is the back of the starter motor, I used a 7mm cranked ring spanner to get into the protective washer. The threads are rusty so the whole rod came out, at least it didn't snap. I had dismantled this before so I hoped it would be OK this time as well. If you look at the previous image of the starter motor in situ, you will notice 2 locking nuts on each rod. These are what I put on last time and I actually use these now to do most of the tightening so that there isn't too much tension on the 7mm AF nut. The thread itself is only M6 so a 7mm AF nut really is too small to last over 15 years under the car. 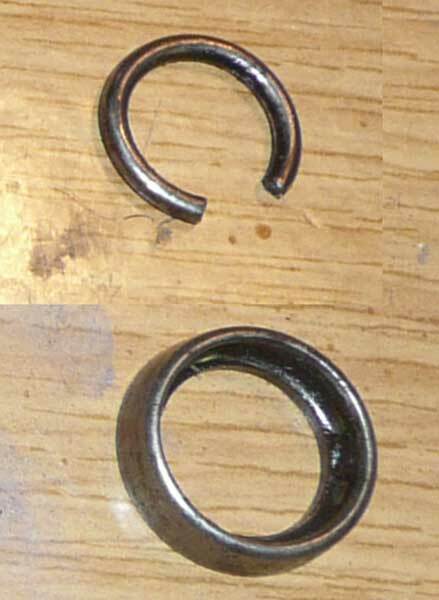 This is how I got the retaining ring off the spring ring, a long socket and a few taps with a hammer. The retaining ring slides down and the spring ring comes out of the groove some way, although it isn't quite as big as the 12mm shaft so I still had to slide it off the shaft, it was still quite tight. 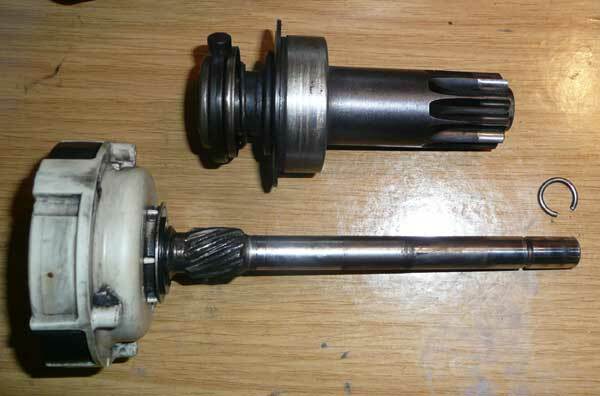 Now dissassembled, here is the pinion assembly, and the pinion shaft assembly. 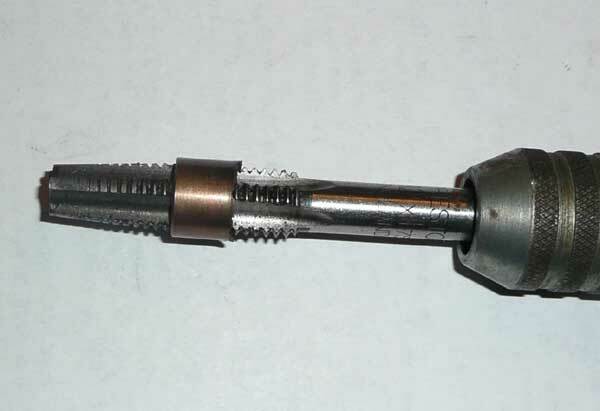 There is a one way clutch on the pinion assembly in the metal shroud you can see at the bottom of the pinion. 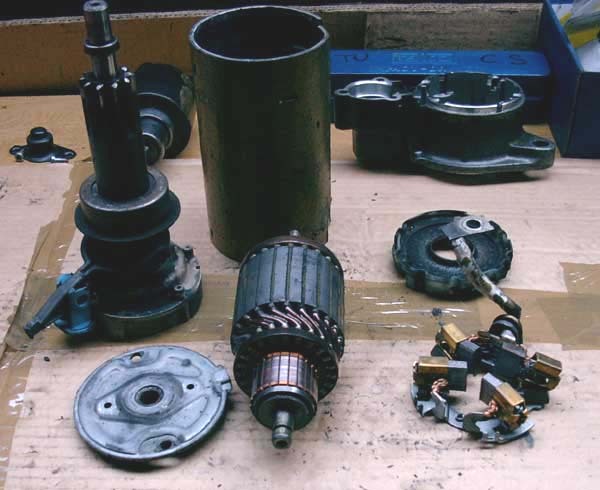 This ensures that once the engine starts the flywheel doesn't spin the pinion shaft and the armature, if it did it might burn out the starter motor. 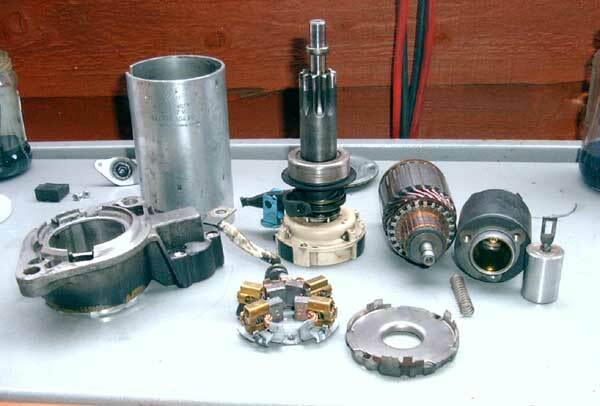 you can also see the male part of the 'bendix' which is the bit that moves the pinion towards the flywheel. There is also a clutch in the white plastic housing, I think this is a secondary way of ensuring that the armature never spins faster than it should. If anybody can explain this properly please let me know. 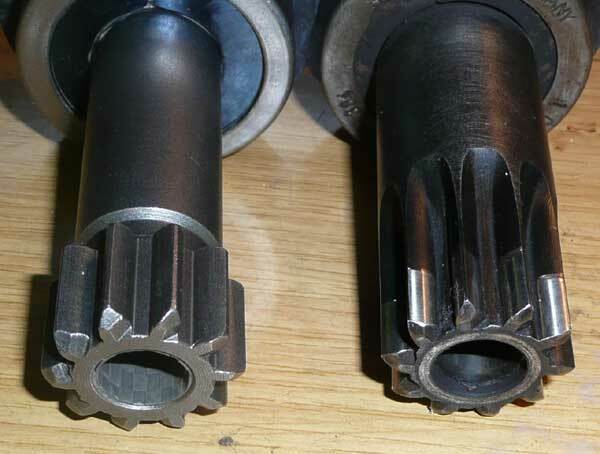 The difference between the new and the old pinion, the new one does look quite a bit more robust, it also has a textured surface on the inside for retaining grease. 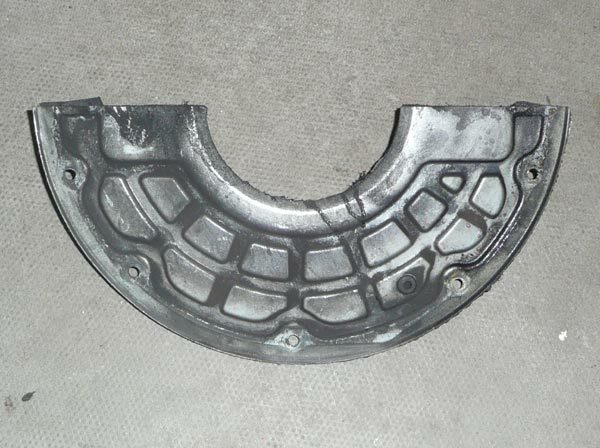 This is a pattern part not a Bosch one, we can supply these if necessary. I was a bit wary of using too much grease here as the part of the shaft that this slides on is open to dust from the clutch so I used a very light oil. I applied the oil to the shaft, then slid the pinion up and down a couple of times, then wiped any oil off the exposed part of the shaft. 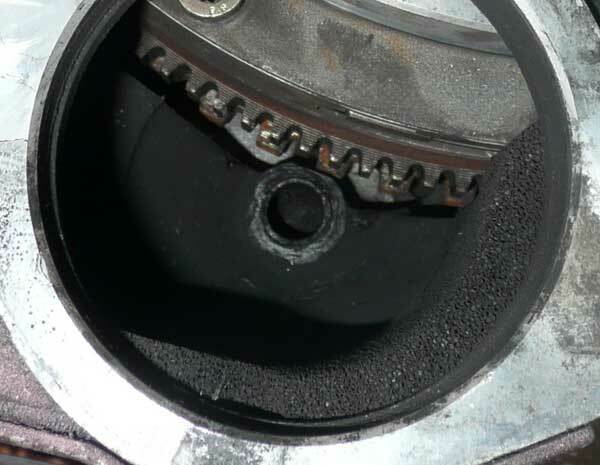 Hopefully this will avoid any friction materials from the clutch sticking to the part of the shaft that the pinion slides on. This is the pinion, pinion shaft, spring ring and retaining ring prior to assembly. 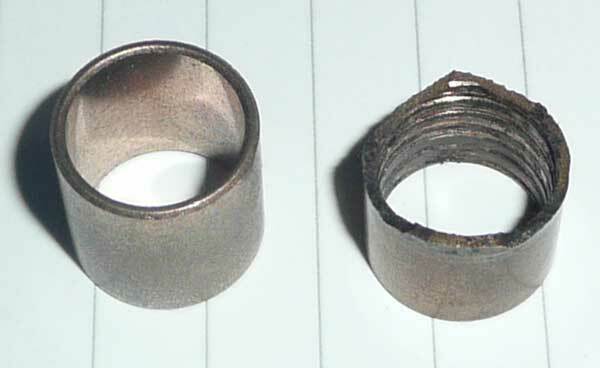 Close up of the spring ring and retaining ring. 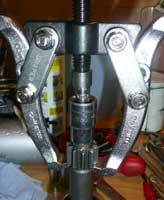 I pushed a socket over the spring ring to first of all compress it into the groove on the shaft. Then used a bearing puller to draw the retaining ring over the spring ring. 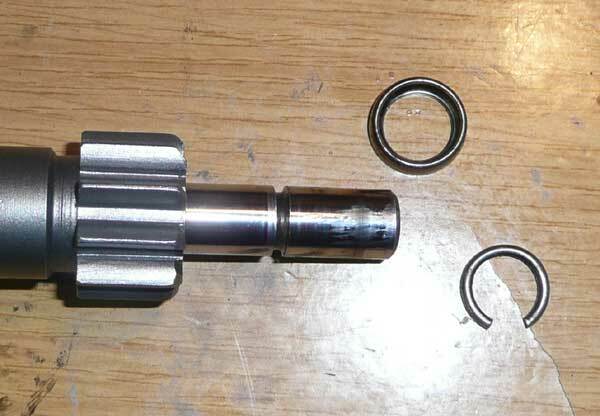 I had to drill the socket out to 12.5mm to clear the pinion shaft which is 12mm. 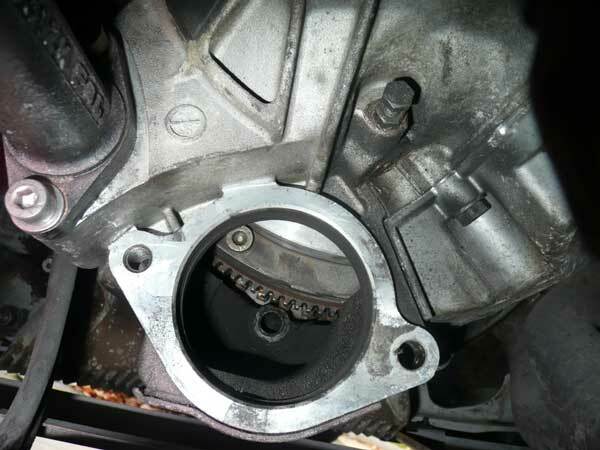 As you can see I also used a smaller socket so that the bearing puller was pushing down on the shaft and at the same time pulling the new pinion up which was pushing the retaining ring over the spring ring as it was released from the socket, does that all make sense. This is the new solenoid ready to go on. This is a pattern part not a Bosch one. For the amount of times that the car is being used I felt that as long as the part is OE quality it doesn't need to be Bosch. Some will feel that only Bosch will do. 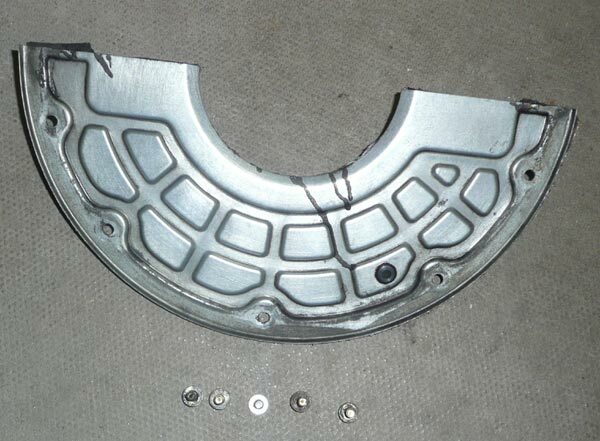 We are able to supply either the Bosch or the pattern part if required. Full starter motor assembled and ready for installation back on the car. 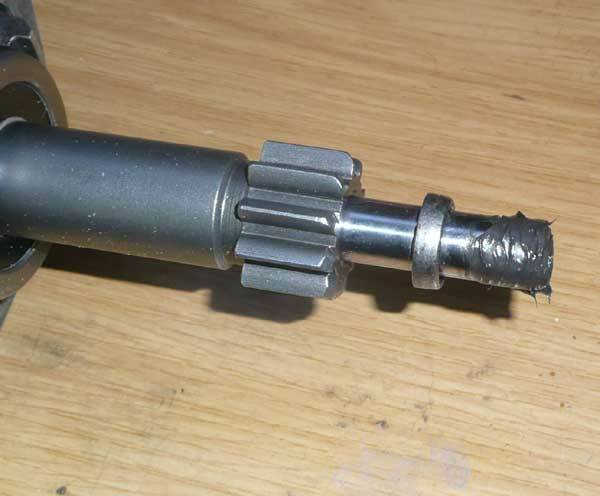 I greased the end of the pinion shaft to go into the pinion shaft bush. This is the new bush compared to the old bush, Although the inside diameter of the bush wasn't too bad the edge had started to break up. Not sure why, as the bush shouldn't be subject to any impact, unless it is sticking out of the housing. 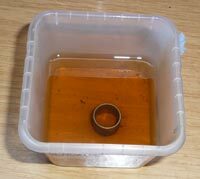 Over the weekend I had left the new phosphor bronze bush in some engine oil to soak. 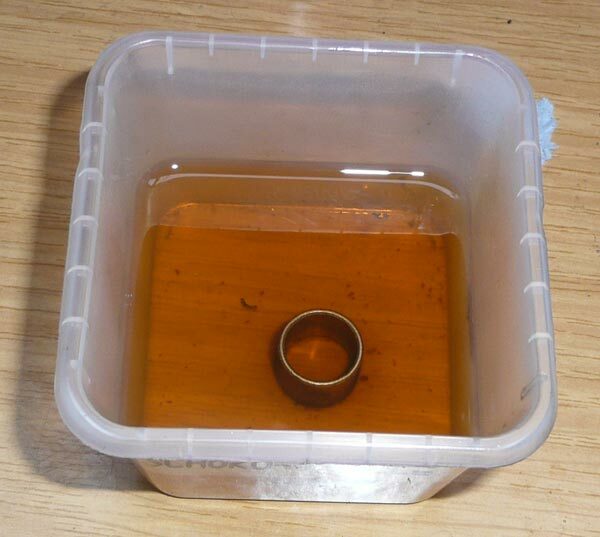 Phosphor Bronze bushes are porous and soaking them in oil can impregnate them with the oil to help prolong the life of the bush. 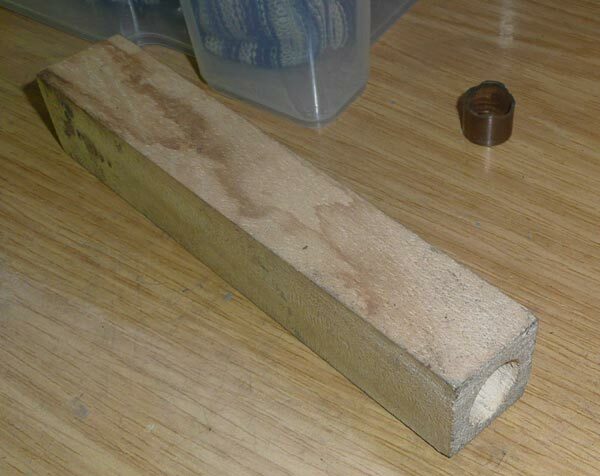 I made this wooden drift to knock the bush into place without damaging it. I put a large dab of grease in the recess to hold the bush as well as to grease the bush. To line up the bush in the housing during installation I passed a long socket through from the other side of the housing. Once I had got the bush half way in I turned the drift around so that I could knock the bush in flush with the housing. Here's the bush in situ in it's housing. When I started the car it immediately just seemed to start 'healthier'. I took it for the drive I had been promising myself and it performed as it always has, effortlessly. But the problem has been with the starter motor and hot starts so driving it isn't really a test of the starter motor 'hot start problem'. So when I came home instead of getting out of the car and opening the garage with the engine still running I switched it off. The missus happened to turn up at that point with the kids so it was a good opportunity to help them into the house, have a chat for 5 minutes etc. using up a bit of time as if I had stopped at a petrol station, which is when the problem usually reared it's ugly head. I started the car with no problems. OK good, when I got the car in the garage I switched it off and pottered about a bit, another 5 minutes and tried it again and again it started fine. Hopefully it will continue to now be clear of the problem. I will of course keep you updated if anything changes.